Around the time telerik released the Q4 r.a.d.controls, they also released an update to the telerik reporting CTP (see my original review of CTP1). In the new CTP, telerik has started to introduce some fit-and-finish improvements to the Visual Studio design-time experience and they have delivered a major feature to the report viewers: PDF export. Read on for my full review or check out my new screenshot gallery to see what's new in CTP2. Not much has changed during the installation process in CTP2. The install took about five minutes to complete, but this time it had no trouble installing the sample AdventureWorksT database on my local copy of SQL Server 2005 Developer Edition (something CTP1 choked on). Still, the installer failed to update the configuration of the provided samples with the name of my local SQL Server (MSSQLSERVER vs. SQLEXPRESS), so to use the designer previews I had to manually update the SqlConnection object connection string. Not a big deal for a CTP or for demo files, especially since the Web.Config and App.Config did get correctly updated by the installer. The look and feel of the Visual Studio Report Designer has been significantly improved since the first CTP. The bars splitting each report section in the designer are larger- which makes it easier to right-click on the bar and reveal options such "Add New Group"- and have a nice Outlook-esque gradient fill (screenshot). There are still just two report element types: textbox and imagebox. More report elements should be available by the time the beta roles around, but in the mean time telerik has improved the design-time placeholder appearance for the imagebox elements. The Report Explorer also works in CTP2 (I don't think it was working in CTP1) and it is a very helpful tool for traversing the layout of your report. Using the Explorer, you can quickly access any element in your report, which makes it much easier to work with large, complicated reports. It's also one of the most annoying parts of the CTP because every time you open a report Visual Studio re-opens the Report Explorer and Data Explorer windows (even if you've closed them). It gets old to wait on these windows to open when you switch between design view and code view. Very old. If you download CTP2, don't close these windows. CTP2 ships with the same group of demo reports that we saw in CTP1 and it adds a couple of new reports that highlight report event handling and styling. The event handler report shows how you can use the Report and ReportItem events to apply custom formatting to a report, such as changing the color a ReportItem textbox OnDataBound based on criteria you code (Fig 1). Hopefully future versions of reporting will provide a visual designer that enables code-less conditional formatting of ReportItems (similar to Crystal Reports), but for now you can manually write the C# to apply formatting on these events. The styling report highlights the reporting's ability to style report objects a la CSS by using defined StyleNames (Fig 2). Otherwise, the designer still works the same way- you have a main design view, a Preview View (or WinForms Preview), and a HtmlPreview (or WebForms Preview). The most significant change in this CTP is definitely the addition of PDF export in the viewers. This marks the beginning of telerik's journey down the road of building and supporting a full PDF export engine that may eventually make its way out of reporting and give developers a new .NET PDF export option (WebSupergoo is good, but I want more (good) choices!). To export any report to PDF, simply select the PDF format from the Export drop down and click Export. After that everything happens as you'd expect: your report opens in an Adobe PDF viewer looking just like it did in the viewer (Fig 3). So far the PDF export looks good. The (quickly) rendered PDF is very true to the original report format and the page breaks are clean on multi-page reports (Fig 4). With the addition of PDF, the viewers can now export to three formats: TIFF, MHTML, and PDF. We're still waiting on HTML, Word, and JPEG. We did not see tons of change in CTP2, so this is still a very alpha version of the product. The December CTP of telerik reporting is another solid step towards the final telerik reporting product, though. PDF export will be a big part of reporting's feature set, so getting that functionality on the table is a good sign that things are going well. Telerik has previously said that we can expect to see the first beta in the Q1 2007 time frame but they have made not indication of when reporting will ship. Based on the progress I've seen in CTP2, I would guess that reporting will not be ready for prime time until late Q2 or Q3 of 2007. And when it does, it will definitely be a great .NET reporting product. One of the controls that received a major overhaul in the Q4 2006 is r.a.d.chart, telerik's long ignored and relatively basic charting component. The Q4 release did little to add functionality to chart (there are still no 3D charts or chart integration with AJAX), but it did radically change chart's design-time experience. If you have ever used chart before, you know that designing a chart in Visual Studio is a long, frustrating cycle of guess-and-check coding. That all changes in Q4. The new chart design-time experience Version 3.0 of chart introduces a new WYSIWYG Visual Studio designer that makes designing a new r.a.d.chart as easy as designing a Microsoft Office chart. When you drop a chart control on your page, you get a Visual Studio SmartTag to set some of your chart's properties AND you get a full, multi-step wizard that you can also use to set 95% of your chart's properties. On top of that, all of the changes you make with the SmartTag or Wizard are applied in real-time to the chart on your page. That's right: No more guessing. You can adjust settings to your hearts content and in real-time see how those settings affect your chart in the Visual Studio design view. The new design-time experience is so vast, I decided pictures would do a much better job of telling the full story. Check out my screenshot gallery to see chart 3.0 in action. My only complaint is that the wizard has so many settings it can be overwhelming. The wizard reminds me of the r.a.d.controls for WinForms configuration dialogs (which have TONS of settings), and I think telerik will eventually need to find a more balanced ground between offering "magical" wizards and wizards that allow you to tweak every chart property. Not a big deal, though. the "gotchas" No update this large can be made without a few lingering issues, and in my early use I found a couple of things that you'll need watch for in your own projects. First, if you use the Chart Wizard to layout your chart, try visiting the Auto Format tab before you go through each wizard step customizing layout items. If you select an Auto Format after you've made a number of customizations, your changes will be overridden by the auto styles. In my opinion, the Auto Format tab should be presented earlier in the wizard so you can pick a style before you begin your customizations. Also, you'll need to watch the formatting of the axis labels. For some reason, the labels don't seem to inherit the styles of your format correctly and are rendered in a default black Times font. This is obvious in the Visual Studio designer, so just make sure you manually set the styles for these items if you display them. Finally, (and this is more of a FYI than a gotcha) make sure your chart looks correct in Visual Studio before publishing your project. Your chart will render in the browser exactly as it looks in Visual Studio, so if you see labels that are illegible in Visual Studio they will also be illegible in the browser. This is a nice behavior because it makes it very easy to tell of you chart settings are well formed before you publish your project to a browser. conclusion The new designer for chart is very impressive and finally makes chart a "r.a.d." control. I really can't express how exciting these changes are for chart. If you've had a bad experience with chart in the past, now is the time to give it another try. If you don't believe me, check the full screenshot gallery I've created showing off the new designers while you download the latest release. But believe me, you'll want chart 3.0! In a move that is sure to make it easier for people evaluating r.a.d.controls to fully test the controls in their development environments, telerik announced in their recent Q4 Newsletter that it would be eliminating the need for license files on all future trial downloads. Instead, the trials will now be "time bombed" and they will expire after 30 days. The huge upside to this is that you can now use the trial version of the components on any domain that you please. Trails won't be restricted to localhost (0r the single domain that you request for your trial license) and will be easy to use wherever you need to do your testing. As subscription developers, we enjoy unusually pain-free, no-hassle licensing with r.a.d.controls and now new comers to the r.a.d. suite can enjoy the same...well, for 30 days at least. The waiting is over: Telerik officially released Q4 2006 today. And even though they missed the original release target, delivering a release this big a day late is pretty significant accomplishment (especially after the week long release delays earlier this year). For a full list of changes in this release, check out the release history. There are a couple if controls in this release that are not backwards compatible, namely calendar and spell. Make sure you have time to update those controls on your pages before you upgrade. So stop reading this and start downloading Q4 right now. It's a great release- the improved spell and chart should be reason enough- and all developers are going to want to run this version. Enjoy the Holidays and enjoy Q4! Well, visually appealing skins for the color blind to be more accurate. According to an August 2000 article by Chuck Newman, approximately 1 in 12 (or about 8%) of the visitors to your website may be suffering from one form of color blindness or another. For those of us that do not suffer from any form of color blindness, understanding what our sites look like through their eyes can be an extremely challenging (and often overlooked) task. Telerik's controls go a long way to make our site's accessible to most of our visitors. Half of telerik's 18 r.a.d.controls for ASP.NET offer out of the box Section 508 compliance at a W3C "AA" or "AAA" level (the other half offers at least "A" level support). The W3C sets forth guidelines that encourage developers to create designs that don't rely on color alone, but recognizing the usability problems caused by color is difficult (especially when were caught up in using all of the great looking (to non-colorblind users) telerik skins). Fortunately, there is a tool that allows non-colorblind developers to see through colorblind eyes. The Colorblind Filter by Wickline is a free, web-based tool that will process any URL you provide and spit out a colorblind variant of the page. While the color representations may be rough, they do enable developers and designers to quickly recognize possible color problems. I ran a number of telerik skins through the Filter and most of them proved remarkably usable to all forms of colorblindness. Telerik has done a good job maintaining high contrast in their controls, meaning that even with distorted colors their controls remain usable. If you've created a custom skin, though, you should definitely run it through the Colorblind Filter and make sure it's accessible to all of your users. You may be surprised at how your site looks through someone else's eyes. Rumen Stankov has a good post on the telerik blogs regarding r.a.d.controls compatibility with this latest release. In short, the new RC will not work with the current Q3 SP3 r.a.d.controls release, but the Q4 2006 release (due next Wednesday) will deliver full support. Looks like it will be a busy weekend installing SP1, downloading the latest ASP.NET AJAX and Toolkit releases, and playing with Aptana. Don't pretend you won't be doing it too. Aptana is being developed and distributed under the EPL (Eclipse Public License), which means the binaries and source code are being made publicly available for free. What's more, the EPL allows developers to take EPL licensed software, build proprietary add-ons or modifications, and redistribute them commercially and royalty free. The EPL is much more liberal in that sense than the GPL and it amazes me that a tool as incredible as Aptana is being given away so freely. Aptana is still a beta product, though, so maybe plans for a commercial version will emerge with time. I hope they do because this development team is doing great work. My words can do little justice to the Aptana project, so I encourage you to check out their site (which itself is amazingly well constructed!) and see Aptana firsthand. If Aptana remains a free product once it leaves beta, I think it could easily stand second only to FireFox as one of the best looking and most useful Open Source projects ever created. The Q4 beta program got a big boost today with the release of r.a.d.editor 7.0 beta. The headline-grabbing feature of the new editor is the much anticipated AJAX spellcheck mechanism that eliminates the need to use a dialog based spellchecker (though the dialog checker will still be available). I'm happy to report that Christmas comes early this year because the new spelling mechanism rocks! The early preview of spell 3.0's AJAX spellchecker (the foundation for editor's new spellchecker) was pretty ugly and did not seem to be doing much that improved upon existing AJAX spellcheckers (such as those found in Google Docs, Blogger, etc.). The pre-release version we see in the editor beta, though, is amazing. It is the best AJAX spellcheck I've used to date and it looks great, too. Unlike other AJAX spell checkers, telerik's new checker will automatically jump to misspelled words in your document as you check them (vs. forcing you to hunt for and click the highlighted misspellings). This combines the fluid, in-document context of an AJAX checker with the convenience of a dialog checker in way that many other AJAX checkers fail to do. The beta also sports a few additional enhancements, including a number of performance tweaks and optimizations that are supposed to produce more consistent editor output in different browsers. There have not been any major changes to the editor structure in Q4 (you still need the editor RadControls folder), but telerik has said that editor will see some major changes in 2007 as they try to move towards a more modularized, RadControls-folder-independent control. The AJAX spellcheck has been one of the most highly anticipated new features of the Q4 release and I think telerik has hit a home run with their implementation. Check it our for yourself today by visiting the beta demo and start scheduling time to upgrade all of your spell and editor implementations today! Telerik finally got a Q4 2006 beta out the door today with the delivery of calendar 2.0. As predicted back in November, calendar 2.0's major enhancement is the addition of a new time picker. The time picker, like the date picker, allows users to click a button and and select a time from a table of available times. Developers have complete control over the time table template, time selection interval, and time format, which should make the control flexible enough for many different implementations. Combined with the existing date picker, telerik has delivered a rudimentary scheduling control that lays a foundation they will be able to expand upon in future releases. There are some other notable changes in calendar 2.0 that all upgrading developers should know. First and foremost, calendar 2.0 is not backwards compatible with previous calendar versions. Telerik has changed the entire skinning mechanism of calendar (eliminating the VisualSettings properties) so that calendar now uses the standard telerik skinning process. The benefit of this change is that multiple calendars on the same page can use different skins, a feat previously unachievable. Telerik has also removed the "Mode" (client, server, ajax) settings for calendar. By default, calendar will operate entirely client-side and will only operate server-side if AutoPostBack is enabled. Calendar's internal AJAX mechanism has also been removed requiring all future calendar AJAX request use r.a.d.ajax integration. You can play with the new beta on the telerik website or you can read the (hidden) help documentation for calendar 2.0 here. All in all this looks like a solid improvement for the calendar control and any developer waiting for telerik to add time picking features should be happy with this release. So far Q4 is looking good! The 2007 Sys-Con Readers' Choice Awards have nominated telerik's r.a.d.control suite in the "Best .NET Libraries and Controls" category and r.a.d.ajax in the "Best AJAX Framework" category. Telerik is up against some large industry players in both categories, such as Microsoft's ASP.NET AJAX in the Framework category and Infragistics NetAdvantage for .NET in the Library category. In 2005 (the last award year), telerik was first runner-up in the "Best .NET Libraries and Controls" category, coming in second to Sybase's DataWindow.NET. According to Sys-Con's website, nominations for these awards closed October 1st and voting began November 1st. Their site is in need of some attention, though, because it appears that the nomination form is still active and the voting form is nowhere to be found. Nonetheless, if you are a fan of the telerik products and you want to participate in the "Oscars for the Software Industry", you have until December 31st to make your vote count. That is, of course, if you can figure out where to vote. Update: No thanks to the Sys-Con site, I've found the real link to the 2007 Readers' Choice voting page. Click here to officialy get your vote on. Do you use telerik.com a lot as you work with the r.a.d.controls? Are there things about the site that you wish were different? Now is the time to let your voice be heard by participating in the new telerik "Web-site Survey" available from your Client.net account homepage. Telerik will be redesigning their website in 2007, pulling together the separate Sitefinity, DotNetNuke, Sharepoint, and Microsoft Content Management Server sites into one telerik site that is better structured to display all of telerik's products. At the same time, telerik will be trying to improve telerik.com for those of us that use it often, making common tasks easier to complete and making helpful information easier to find. If you participate in the short, nine question survey you'll also get 2500 Telerik Points good towards any telerik purchase (that's $25 for those exhausted from converting Microsoft Points and Nintendo Points for online game play of late). Not a bad deal for a few minutes out of your Monday routine. Update: I wasn't sure if the direct link to the survey was tied to each Client.net account, but I now know that it's not. You can go directly to the suvery by following this link. You'll just need to provide your Client.net email address to get your points at the end of the survey. From an end user perspective, I don't think WPF/e is going to do much to change the way people interact with the web. All of the existing demos showing possible implementations of WPF/e do things that Flash is already doing and that users are already used to (such as platform-independent web video). Some of the WPF/e demos feature "innovative 3D interfaces"- those that allow users to pick an item from a floating, spinning 3D environment- that remind me of the serious usability errors made by early implementations of Flash. Just because you can do (faux) 3D doesn't mean that you should, and most web usability experts would say you shouldn't. Flash had to learn that the hard way, stigmatized as a bad tool to include on "professional" web pages for many years because of its early gratuitous over use (do we really want our menus to bounce when we click them?). Hopefully developers won't do the same thing with WPF/e. The real challenge for WPF/e, though, will be the rate at which the WPF/e plug-in is adopted. Like Flash and Flash Player, WPF/e requires the user to download and install a small plug-in to view WPF/e pages. The success of Flash has long been attributed (in part) to its 98% global desktop penetration. Developers can count on Flash player being installed on users' computers and design for it. WPF/e will likely achieve good penetration on Windows PCs, but it has a lot of ground to make up to make the platform as pervasive as Flash. There is no doubt that WPF/e is a great new tool to add to our developer tool-belt, and it will be interesting to watch how telerik interacts with the new platform. Will it radically change the web as some suggest? I don't think so, but I suppose time will tell. What do you think? If you develop for the web (and you care about your users) then you must test your applications in the 4 - 5 "top tier" browsers, which include Internet Explorer, FireFox, Safari, Opera, and Netscape. Furthermore, you usually need to test your applications in a few different versions of the top tier browsers to make sure you know how your site will behave when users of old browsers come a knockin'. This is a straight forward task for all browsers but one: Internet Explorer. Microsoft officially introduced Internet Explorer 7 to the world last month and officially made developers lives harder. You cannot run IE6 on a computer that has IE7 installed. While there are hacks out there that allow you to "trick" the OS into running a special IE7 build on an IE6 computer, they are not supported by Microsoft and they do not accurately simulate your users' IE7 experience. It is unclear why Microsoft thought developers would not need to continue IE6 testing for years to come (and thus provide no support for side-by-side testing), but they have seen the error of their way and offered a new option. Last week, the IEBlog announced that Microsoft would be making Virtual PC 2004 bundled with a pre-activated copy of Windows XP SP2 and IE6 a free download. That's right, you can now do Virtual PC testing of you web apps without the need to purchase an additional Windows XP license (the requirement until last week). This is huge news and a very generous (albeit necessary) peace offering from Microsoft to help developers test applications in older versions of IE. It is possible that VPC images with older versions of IE (like IE5.5, IE5, etc.) may become available, but for now it's just IE6. So if you're like me and you've been running hacks to test with IE7 and IE6, dump the hacks, install IE7 on your primary dev box, and download the free goods from Microsoft today! A little more than a week has passed since Microsoft announced that it would be making the Office 2007 UI available to application developers via a perpetual, royalty free, no charge license and today telerik announced that they would be an early participant in the license program. The program makes the new Office UI freely available to any developer interested in building applications or components that implement the (love it or hate it) Office 2007 UI. The only catch is that you cannot use the license to build applications that compete with Microsoft Office (seems fair enough). What makes the telerik announcement significant, though, is that all participants in the license program must agree to strictly adhere to the 120+ page Office 2007 UI Guidelines. The guidelines in this document come in three flavors- required ("MUST"), optional ("SHOULD"), and Best Practice- and they aim to ensure all implementations of the Office UI are done consistently and correctly. The guidelines are illustrated, detailed and very thorough, so little is left to the imagination regarding the correct implementation of Office UI components (like Ribbon, Quick Access Toolbar, etc.). Ribbon Groups must have at least two variants: "Large" and "Collapsed"
And that's just a few of the many required guidelines for Ribbon alone! Clearly, any component that implements the UI Guidelines to a Best Practice level will be a very full featured and powerful UI component. Telerik's announcement is exciting because we know that future versions of their Office 2007 controls (for the Web and Windows) will fully implement the features outlined in these Guidelines. Notice that I said Web and Windows. The official Guidelines FAQ makes it clear that web components must fully implement all required UI features, just like their Windows brethren. It looks like 2007 is going to be a fun year for UI development! During my time developing at a Fortune 200 I/T shop, I found that the simple task of bringing in a new desktop application can take hundreds of hours. You've got to get your Software Packaging team to package and verify the software, then you've got to get your Security team to validate the package, then you've got to get your Desktop Change Control Board to approve the new software for the desktop environment, then you've got to Software Distribution to schedule the deployment of the software to correct users, and finally you've got to help your end users find the new application on their computer. And all that assumes your Legal Department didn't have any issues with the installation license for the software; if they did, tack an extra 3 months onto the process for contract and license negotiations. The web is not immune from all of these problems, but my experience has been that it is much easier to introduce a new web application to an Enterprise environment. Once a contract is in place (or if it's in house development, once the application is live), just email a new link to your users and everyone is on their way (with a little training, of course). I emphasized early that this philosophy applies primarily to business applications, such as data manipulation applications, office-like applications, and the like. The web is still a long way from being a suitable replacement for all desktop applications (can you imagine doing your Visual Studio development in a web app? ), so at the end of the day the appropriateness of the web depends entirely on your situation and application. Three years ago I would have called you crazy if you told me that Office could be replaced by web apps; today I'd tell to you it's only a matter of time (for average users- power users are a different bunch that will hit the limits of web apps quickly). So where is the tie in to telerik? After all, this is the "Telerik Watch" blog. Quite simply, telerik controls take the User Interface question out of the equation when trying to decided between Web and Windows. Any user interface that you could build for a WinForms application using Visual Studio can just as easily be built for the web using r.a.d.controls for ASP.NET. Whatever other reasons you may find that the web is not appropriate for your application, limits due to your ability to create a desktop-like UI shouldn't be among them. With r.a.d.ajax it is very easy to create responsive, desktop-like experiences on the Web and the other 17 controls in the suite give you most of the tools you'll need to finish the job. Web or Windows? The answer depends on your situation, but the application UI will be easy to build and will look great either way if you use r.a.d.controls. Thanks to Jason Burch, VB developers in the telerik community can now build telerik reporting reports using a VB project instead of the provided C# examples. He took the time to convert the C# report template item into its VB variant and posted the code to this forum thread on telerik.com. This code applies to the November CTP of telerik reporting that I previewed last week and should be used by developers that would rather test the CTP with a VB project (instead of a C# project). I should note, though, that the visual designer used to build the reporting reports makes it unnecessary to deal with the auto generated code unless you're tweaking or just interested in what's going on. New client-side row operations for r.a.d.grid. This is a pretty big feature enhancement for grid that should come as a welcome addition for many developers. The new client-side features will allow developers to implement completely client-side row deletes (and possibly client-side inserts and updates) that will be persisted back to the server on the next PostBack/Callback. Vlad Enchev from the grid team posted a great blog entry on the upcoming feature here along with a link to a live demo of the delete feature. Enhanced editor RealFontSize toolbar. Anyone looking for more out-of-the-box power to choose your font units in editor should get a big productivity boost with the enhanced RealFontSize toolbar in Q4. The enhanced toolbar will supposedly deliver the ability to switch between relative, pixel, point and other font units with simple configuration file settings. r.a.d.upload to be integrated with r.a.d.editor Developers using editor to upload files will no longer have to create a custom editor dialog to take full control of the upload process. The telerik team will be integrating r.a.d.upload into editor giving developer's complete access to the features exposed by the upload product, including the ProgressArea functionality. r.a.d.spell will use the standard skinning mechanism One of the changes we can expect to see in spell 3.0 (besides the new AJAX spell check mode) is the adoption of the "standard" telerik skinning mechanism. That means it should be very easy to change spell's skins in the future via the normal Skin property. Video tutorials for r.a.d.controls If a picture is worth a thousand words, then telerik will be adding hundreds of thousands worth of words to the r.a.d.control help in Q4 with the formal introduction of video tutorials. These videos will allow developers to watch r.a.d.controls development in action and they will hopefully help answer a number of common questions. Are there any video tutorials you want to see? Improved r.a.d.menu configuration wizard (maybe) While the confirmation that menu's configuration wizard would be improved in Q4 was a little weak, there is some hope that the Q4 wizard will finally allow developers to re-order menu items. It seems like an obvious feature, especially since the grid wizard lets you reorder columns, so I hope that the team finds the time to get it into the release. Word wrap for nodes in r.a.d.treeview (maybe) This is another feature with weak commitment to the Q4 release, but if does make it it will allow long text on treeview nodes to wrap. According to members of the telerik community, this feature will be unique among many treeview controls and will further distance telerik's treeview from the competition. Many new properties in r.a.d.window There are a number of posts in the forums with references to features telerik wants to include in window's Q4 release. Among them are new client-side events that fire when a window is moved or re-sized, new properties that give developers access to a window's header and footer, a new MinimizeMode, a handful of new client-side API properties, a constrainable drag area for windows (unlikely that this feature will make it), and full use of Embedded Web Resources (for .NET 2). window is not a control slated for a "major" update in Q4, though, so it's possible many of these features could be cut if the dev teams run out of time. Improved localization capabilities for all r.a.d.controls Based on community feedback, telerik will be improving the way its localizable controls (editor, spell, upload, window, and calendar) handle localization. There is not much detail on pending improvements, but it is possible telerik will implement a feature that will enable the control to auto detect the current culture settings of an user and apply the correct localization settings. The last release of 2006 is scheduled for mid-December, so we should start to see some betas in the next couple of weeks. When we do, I'll be sure to check for these features and let you know what you can expect to see in the final Q4 release. Which enhancements are you most looking forward to in the next release? Let me know in the comments and I'll pay extra attention. Only six short months ago, telerik announced that it would be delivering a full featured, stand-alone .NET reporting product. We are still months away from a final product, but earlier this month telerik unveiled an early CTP (Community Technology Preview) of reporting to give developers a taste of what's to come. I posted an extensive screenshot gallery of the November CTP early last week, but today I'm going to comment on my overall experience installing, configuring, and using telerik reporting. Even though it is only an "alpha" release, the November CTP of telerik reporting does come with an easy to use Windows installer (Fig 1). Anyone who has used the Windows installer for other telerik products will find the experience familiar. The installer comes with two basic parts: the main binaries for reporting and a number of pre-built examples. One thing not included in the November CTP is documentation (which telerik makes clear on the beta download page), so this CTP is definitely not for the weak of heart. The installer runs fairly quickly; the total install only took a few minutes on my 3.2 GHz, 2 GB RAM desktop machine. The longest stretch of the install is the time that it takes to update the Visual Studio Toolbox, but a moving progress graphic reassures you that the install hasn't hung (Fig 2). My only problem with the install was related to the included SQL Server demo database. The installer was designed to work with SQL Server 2005 Express (which I don't have installed) and it did not recognize my running default instance of SQL Server 2005 Developer Edition. Using some very complete help available on the reporting forums I was able to manually install the database and grant the necessary permissions for the demos. Disaster averted. Most people who install the November CTP will not have any configuration tasks to complete before they can start playing with the demos. Since the installer didn't like Sql Server 2005, though, I had to add a few extra steps to get everything setup correctly. After I followed the instructions for manually installing and configuring the AdventureWorksT sample database, I had to update the Web.Config (for ASP.NET demos) and App.Config (for WinForms demos) files with the correct connection string to my local database. With those quick updates done, I was ready to hit F5 and play with the demos. The November CTP includes seven demo reports for both WebForm and WinForm examples. The same report definitions are actually used for both sets of examples, the only difference between the two is the viewer. Telerik reporting ships with two different viewers, one for the web and one for Windows, both of which look and behave very similarly. The Windows viewer includes a few extra functions (like Zoom and Page Setup), but it's possible the features provided in both viewers will change dramatically between now and the release. The viewers also expose some basic functions like paging, printing, and exporting (to TIFF or MSHTML only, more formats to come in the final release, including PDF, Word, HTML, and more). The report definitions are all stored in a Visual Studio C# project and complied into a single assembly. After I installed the CTP, I first tried to create a new Web Site in VS 2005 to test reporting. That's when I discovered that you cannot add report definitions directly to a Web Project. Instead, you need to create a new C# project and build your report definitions there and then import the complied assembly to your Web (or Windows) application. I'm not sure if that is indicative of how the final product will ship, but at first pass it seems like maintaining report definitions could become a bit of a chore if it requires you to maintain a separate project just for reports. On the other hand, it makes it easier to add reports to your "report assembly" and deploy them to your site if you run complied ASP.NET sites, so there could be some advantages to this configuration. But I digress; back to the demos. The ASP.NET demos (and WinForms demos, for that matter) start on a simple page with a DataList that contains links to the available reports. When you click on a report name, a new page is opened with the report viewer filling 100% of the page (Fig 3). The demos show off a number of features available in reporting, including multi-column support (though that support does not seem to work on the web yet), bound text elements, bound image elements, grouping, and multi-section support. All of the reports look the same on the web or in Windows, with the exception of the multi-column reports that render as single column reports on the web. The demos definitely show the ability that reporting has to create a variety of reports, but the functionality is still very basic. Check out my screenshot gallery to see all of the demo reports. Report definitions end in a .cs (C#) extension, but they they open in a new report Design View. The report Design View gives you a graphical tool for laying out your report and it is complemented by two additional views: the PreviewView and the HTMLPreviewView for WinForms and WebForms respectively. These three views make it easy to modify your report and quickly see how it will render on the web or in Windows, which is a major improvement over preview capabilities other reporting products expose. The design and preview views also integrate directly into the Visual Studio IDE, which is another benefit over products like Crystal Reports. Laying out a report is a familiar affair if you have ever used Microsoft Access' Report Designer or Crystal Reports Report Designer (or any other number of visual report designers I'm sure). In the November CTP, you only have PictureBox and TextBox items to work with on the report but many additional elements (including shapes, sub-reports, etc.) are supposed to be added in the final product. You can right-click on a report to reveal options for adding additional sections (like PageHeader or ReportHeader) or groups to your layout. The GroupReport is the best demo to look at to see how the grouping and sections work (Fig 5). Reports are connected to your data source through standard ASP.NET DataAdapter and DataConnection objects (of the SQL Server variety in the demos). Using the familiar data objects makes it easy to understand the data connection and configuration, but it also makes the data connection feel less integrated with the report as you might expect a reporting product to deliver. I expect the final release will probably address this area too, though I'd consider this a minor issue at worst. Adding a new report to the assembly is easy. Just right click on the solution to add a new item and choose the new "telerik Report" item from the "Add New Item" dialog. Once the report has been added, begin adding TextBox elements and binding them to your data source until you have the report you're after. You can use the Preview views to see how things will look with live data from your database and then jump back to the design view to make any desired changes. When you're done, compile your report project and copy the assembly to your website's bin folder. The final licensing details for telerik reporting have yet to be announced, but we do know that it will be licensed separately from the r.a.d.controls. That shouldn't come as much surprise since this product is a dramatic departure from the other UI controls currently included in the developer license, but it does put reporting on a pedestal to forcing it compete on its own merits. No pricing has been announced, but I expect those details will be available early next year. Even in its current state, telerik reporting is shaping up to be a very compelling product. It will make it very easy to build professional looking reports and deploy them to the web or Windows with little effort. The November CTP is definitely rough around the edges, but the telerik reporting team has at least four full months to enhance and refine before the official release (which is an eternity in telerik release terms!). There is no question that telerik will be up against some very capable and veteran competitors in the reporting space, but telerik's ability to deliver outstanding UI at very affordable prices should give the big guys a run for their money. This will definitely be a must have product for any telerik developer. Set the EnablePageHeadUpdate property of the ajax control to false. This way it will not update the head tag, but if you load dynamically controls with ajax, their stylesheets will not be applied. This is fixable as well, you just need to manually add the stylesheet declarations for the controls on the page. Move the conditional comments out of the head tag. This way they will not be updated by the AjaxManager and still applied depending on the browser version. It is even valid xhtml1.1 as the html comments are not verified by the html validator. Hopefully this little tip will save you some time and help you avoid the possible pitfalls of ajax and conditional comment interaction. Those of you waiting on version two of r.a.d.input (with new data type specific textboxes) will have to wait until Q1 2007 as we learned today that the major update will not be ready for the Q4 2006 release. The next version of input is supposed to include a number of data type specific textboxes for validating input, including textboxes for currency, percentages, and a "vanilla" textbox for accepting unmasked input. Telerik has said several times in the forums that input 2.0 would be in Q4, but it appears the work being done on WinForms controls, reporting, and major upgrades to chart, editor and spell have pushed input 2.0 back a few months. So update your project plans and don't count on seeing version two until March. Office 2007 has gone gold and so has telerik's support for exporting to the Microsoft update. Well, maybe telerik's support is closer to silver, but the support is there nonetheless. Anyone who has tried exporting from grid to Office 2007 has probably discovered that the exported files cannot be read by latest Office version. The problem lies in the encoding used by the grid export method, which currently uses UTF7. This encoding works for current versions of Office, but UTF8 is required for exporting to Office 2007 (an encoding which does not work with older versions of office, of course). To address the problem, telerik introduced two new methods in grid 4.0: ExportToExcel2007 and ExportToWord2007. These methods work just like their ExportToExcel and ExportToWord counterparts except that UTF8 encoding is employed for Office '07 compatibility. Curiously, they do not appear in the Q3 documentation, but I expect that will be fixed soon. I'm also concerned that the method names may cause problems for developers down the road (what happens when Office 2009 comes out? ), but that's not a big deal today. If you are a developer who must support Office 2007 and older versions of office (as I expect many are), you now must deal with the task of figuring out which export method to call depending on your user's installed version of Office (thus my belief that this support is more silver than gold). For now, the best approach may be to simply ask users exporting from your site if they are using Office 2007 and then use the appropriate grid export function. You can avoid annoying your users by saving their first response in a cookie and referring to that value for future export calls. While the support isn't automatic, telerik has provided a method that enables continuing compatibility with the (officially) days old Office version. Anybody supporting (or soon to be supporting) Office 2007 users should take note and use these new methods whenever exporting from grid. In what is becoming typical telerik announcement fanfare (or lack thereof), the first publicly available CTP of telerik reporting was released late last week. Telerik reporting marks telerik's entrance into a brand new product area, one filled with strong competitors like Business Object's Crystal Reports and ComponentOne's Reports for .NET. To the table telerik brings its reputation for making powerful and easy to use .NET components with outstanding support and a loyal community of developers likely to quickly embrace the new tool. Since its announcement in June, reporting has been the one product that I am most looking forward to implementing in my projects. The CTP is definitely not ready for "prime time reporting" with its limited support of report element types and incomplete API, but it affirms that this product is coming along nicely and will likely be ready for production around the Q1 2007 r.a.d.controls release. When it's ready, telerik reporting should enable you to define reports with a visual designer that integrates into Visual Studio and display reports with included WebForms and WinForms report viewers. A number of export formats are planned too, including HTML, Word, Excel, PDF, and TIFF. If you are eager to get your hands on the new product, you can download the first CTP and read all of the release notes here. The next CTP will be available in December and it will be followed by Beta 1 in January. I will post some screenshots of the November CTP later this week for those who don't want to download and play. If you are among the daring downloaders, what do you think of the tool so far? As mentioned in my preview of the Q4 release, telerik will be introducing a new version of spell this December. Version 3 of spell, which is tightly integrated with r.a.d.editor, will embrace AJAX and bring a "Word-like" spell check solution to the web. Users of the popular web-based email solutions provided by Yahoo! and Google will find this AJAX spell check familiar. When using editor, users will be able to click on a button to begin the AJAX spell check. 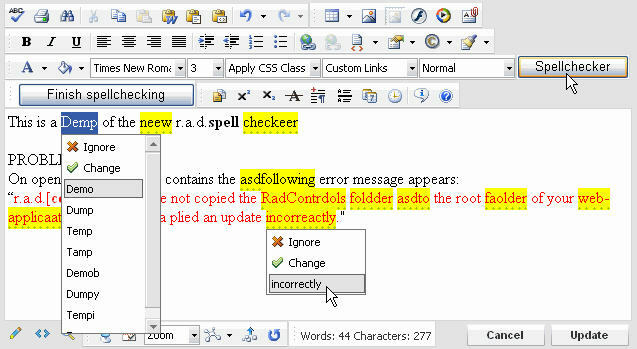 Instead of displaying a spell check pop up, misspelled words will be highlighted and users will be able to click on them to reveal a list of suggested corrections and editing options. When users are done spell checking their document, they will push another button that will commit the changes and hide all of the spell check formatting. This screenshot reveals some of the functionality that we can expect to see in December. It looks ugly now, but telerik's track record for making "good looking" controls is sure to bless this control with a face lift before the official release. Even though this is not the first ASP.NET component to offer this type of AJAX spell check, it is a welcome improvement to the r.a.d.controls suite. When the other .NET spell check components are compared, telerik's generous licensing scheme makes spell 3.0 the best value by a long shot. This is definitely one update in Q4 that I can't wait to start using! Without much fanfare telerik released Q3 2006 SP2 on Wednesday (November 1st). You can download the service pack now from your Client.net account at the telerik website. The most significant enhancement in SP2 is full support in the entire suite for the recently released ASP.NET AJAX Beta 1. The first beta of ASP.NET AJAX (formerly "Atlas") introduced a number of changes to the core AJAX libraries that broke r.a.d.control compatibility. Telerik has quickly responded to those changes, though, and delivered on their promise of "Atlas" support in SP2. Anybody who has been reluctant to install ASP.NET AJAX Beta 1 due to the compatibility problems with r.a.d.controls (like myself) can now commence with downloading the latest toys from Redmond. This service pack also provides additional updates for ajax, calendar, combobox, editor, grid, treeview, and upload. Among the updates are optimizations for ajax and grid and a new ability in combobox to set its width as a percentage (previously unavailable). upload now includes default (or English) localization files and the default skin as part of the assembly (via WebResources), so you shouldn't need the RadControls folder for this control in the future if you use .NET 2. For a full list of changes in SP2, check out this link. All in all, this is a pretty significant service pack that all r.a.d.control developers should download and test in their applications (especially if you're using/considering ASP.NET AJAX). And don't wait too long, Q4 2006 is just 7 short weeks away! The days are getting shorter, clocks have been set back ("the good" DST change), and it's a cool 76 degrees in Texas. Fall has definitely arrived and that means it's time to get ready for the Q4 release of telerik's r.a.d.controls. With the Q3 release (and SP1) just weeks old, telerik is already hard at work preparing the Q4 release set to hit the virtual shelves of your Client.net account near the end of the year. Telerik has updated the public Road Map with a few details about what we can expect to see in Q4 and that's what we'll take a look at today. First, if you've spent any amount of time on the telerik forums you will have likely run into (or submitted yourself) a desperate plea for more documentation and examples for many of the r.a.d.controls. Telerik has heard your cries and a key deliverable of the Q4 release will be expanded documentation and samples for the controls. While many (including myself) think that telerik's documentation is some of the best among peer component developers, additional documentation can never hurt and it will definitely help people just getting started with the r.a.d.controls. Along with the documentation there is promise of several "full-sized" applications to show best practice implementation of r.a.d.controls, which means we'll probably see some new Help Desk Beta like demos. Telerik will also continue their journey of providing full support for ASP.NET AJAX (previously "Atlas") in Q4. The first beta release of ASP.NET AJAX changed a number of things in the core "Atlas" libraries (see Scott Guthrie's informative post) that caused many compatibility problems with r.a.d.controls. Telerik has been quick to analyze the changes, though, and it is likely that a compatibility fix will be delivered before Q4 in a possible Q3 SP2 release. In Q4, telerik will continue to refine the compatibility of all r.a.d.controls with ASP.NET AJAX and introduce a number of demos that highlight the differences between r.a.d.ajax and ASP.NET AJAX (the later of which is also supposed to be officially released before year end with the VS2005 SP1). According to a recent post from telerik, the Q3 2006 SP1 has been delayed until at least Tuesday, October 17th. Telerik is working hard to provide full support for soon to be released IE7 and FF2 in SP1 and the extra testing required to validate those new browsers is in part to blame for the delay. If you are waiting on SP1 to update your application (or if you've been waiting on SP1 to download Q3), check the telerik site late Tuesday or early Wednesday to download this patch. If any additional delays are announced, this post will be updated with the latest news. Telerik announced this week that the first service pack for the recently release Q3 2006 r.a.d.controls will be available Monday, October 16th. This service pack is expected to include cumulative patches for all of the problems that have been identified since the official Q3 release last week, including several problems in grid, treeview, ajax, and tabstrip. Telerik is also planning on including serveral small fixes necessary to make all r.a.d.controls fully supported in the rapidly approaching releases of Microsoft’s Internet Explorer 7 and Mozilla’s Firefox 2. If anything comes up that will delay the release of service pack 1, I will bring the updated timeline to you here. Welcome to the Telerik Watch by Telerik MVP Todd Anglin! Telerik Watch is dedicated to previewing, reviewing, and demoing the newest controls that come from the Bulgarian masters of ASP.NET component development: Telerik. Inspired by the wildly popular SuperSite for Windows by Paul Thurrott, this site aims to bring the same level of attention and analysis to the products created by Telerik that Win SuperSite has brought to Microsoft products for many years. We will track the Telerik Road Map and bring you the latest news on new control development and we will provide illustrated tutorials to demonstrate the use of new controls. Todd Anglin is a Telerik MVP and an avid developer of ASP.NET applications. He has worked on projects for Fortune 200 companies and currently splits his time between supporting the Telerik community, working as a full time I/T Analyst, and growing a small startup company focused on building ASP.NET software as a service. Consistently awarded "Most Active Community Member" by Telerik, Todd has demonstrated a commitment to understanding the telerik controls and supporting the community of developers that relies on them to enhance their ASP.NET projects. This is a site for the Telerik Community by the community, which means we want to know your interests. If there is something that you want to know about the telerik controls (that you can't find on the already exceptional Telerik website, http://www.telerik.com/), contact us and we'll bring the information to you here!